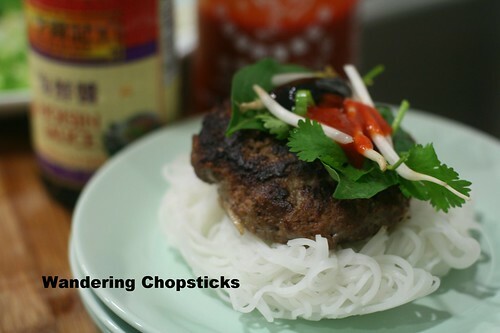 What if, instead of a ramenburger, I made a Pho Burger with Vietnamese Beef Noodle Soup Spices? 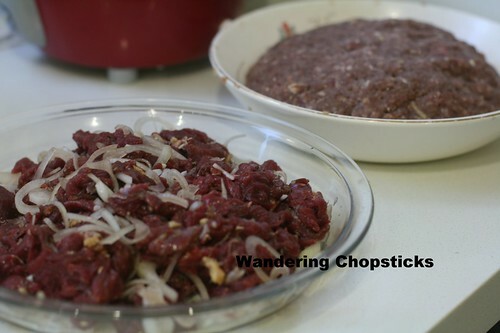 I could grind star anise, cinnamon, and cloves, add some minced garlic and ginger, to ground beef. 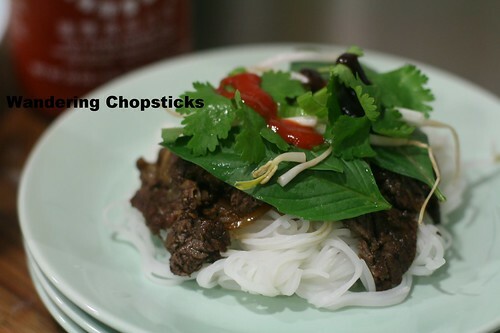 The pho noodle "buns" would be a bit of a challenge, but as rice noodles tend to clump anyway, I could use that to my advantage. 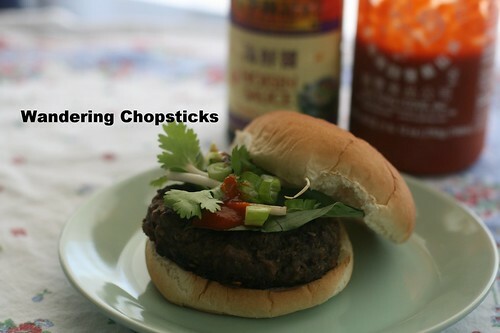 Topped with basil, cilantro, scallions, and bean sprouts and a couple of squirts of sriracha and hoisin sauce. 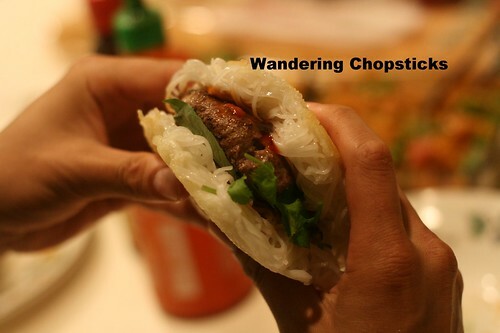 It was literally Pho Bo (Vietnamese Beef Noodle Soup) in a burger. 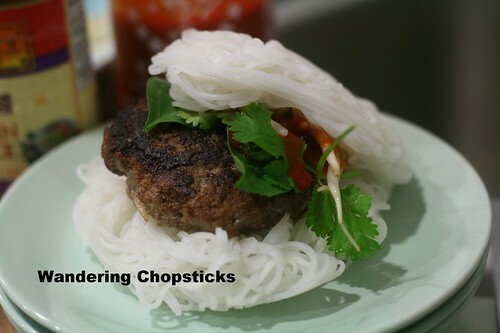 The only problem was that while I got the rice noodles to clump into "buns," they fell apart when holding them to eat like a burger. Pan-frying the noodle "buns" held them together, but was greasy. My brother and his wife and kids came over to test my experiment. They liked it! They liked it! My brother said I was overthinking. 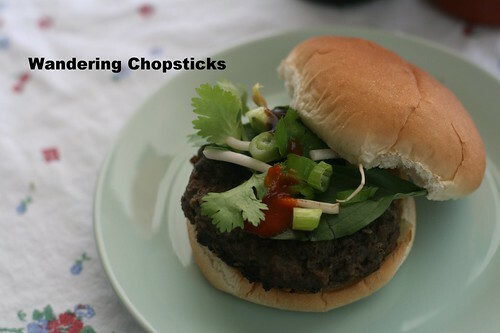 I already had good flavors, why didn't I just do the obvious and put the pho-spiced meat in a hamburger bun? Of course! I had also spiced some sliced beef, to see if ground beef or sliced beef was better, and he suggested making a Banh Mi Pho Bo (Vietnamese Beef Noodle Soup-Spiced Sandwich), but that's saved for another post. 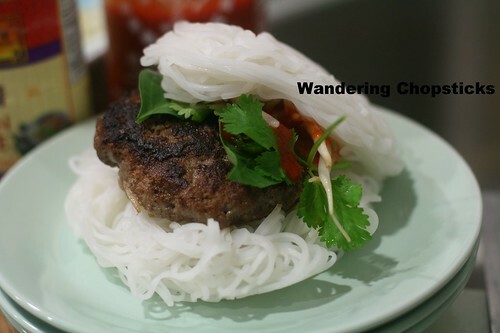 I've included directions for making the pho noodle "buns," but ordinary hamburger buns work just fine for this recipe. 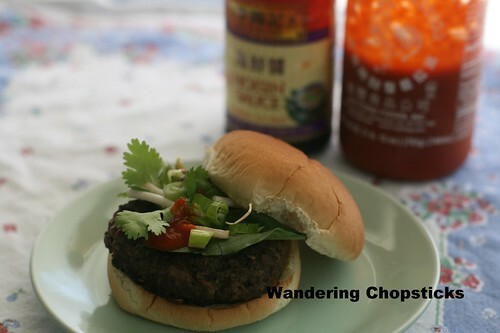 This recipe is based upon about 1/3-lb beef patties, adjust accordingly if you want more or less meat in your burgers. In a bowl, place 2 slices of bread on the bottom and pour 1/3 cup of milk over the bread to soak. 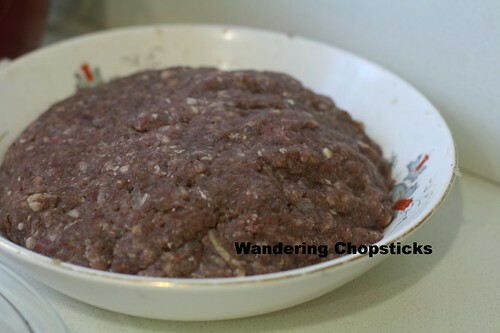 Add 1.5 lbs of ground beef, a grated medium onion, a grated 1-inch knob of ginger, 2 minced garlic cloves, 1 tsp salt, 2 tsps fish sauce, 1 tsp ground cinnamon, 1 tsp ground cloves, and 1/2 tsp ground black pepper. Mix the ingredients thoroughly and set aside. I also did the same to some sliced beef. 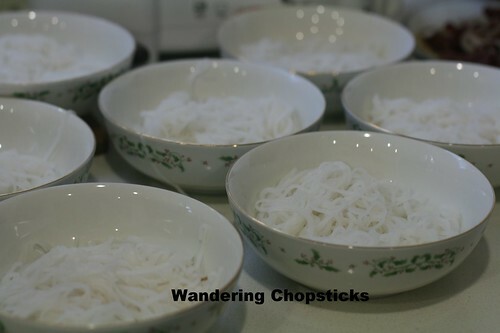 Set a large pot of water to boil and boil and drain the pho noodles if you plan to make rice noodle "buns." You'll need 8 shallow bowls of similar size. If you don't have that many, split boiling the noodles in half so they don't clump up before you can put them in the bowls. 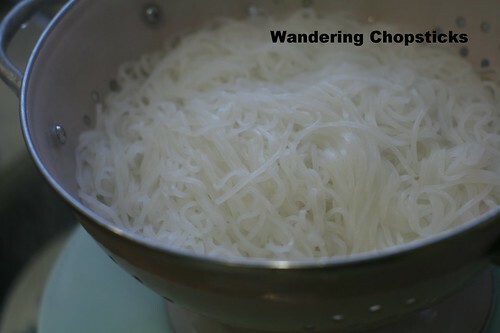 Don't rinse the noodles after draining them into a colander. 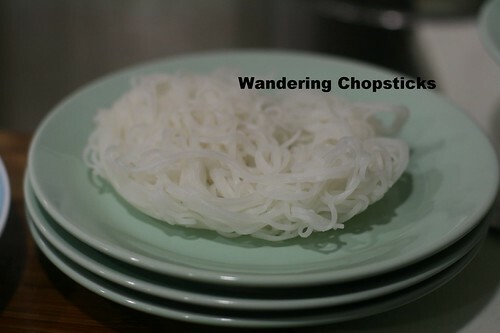 With tongs or a pair of chopsticks, divide the noodles evenly among the 8 bowls, making sure they're round enough to serve as "buns." Set aside to cool down and clump. 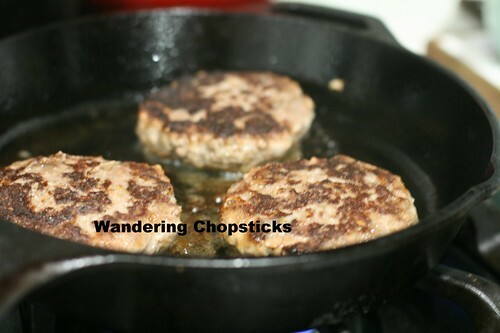 Meanwhile, divide the ground beef and shape them into patties. Grill or pan-fry. 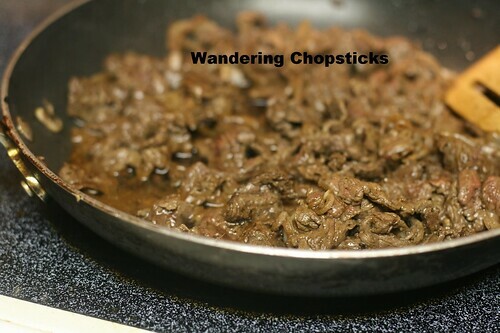 Saute the sliced beef if you plan to use that instead of the ground beef. 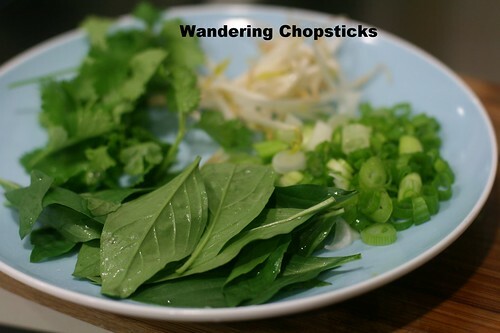 Prepare the garnish platter of Thai basil leaves, cilantro, scallions, and bean sprouts. 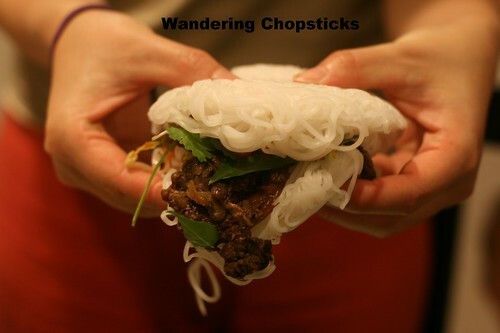 The rice noodle "buns" should have cooled and clumped suffiently by now. Place one "bun" on a plate. 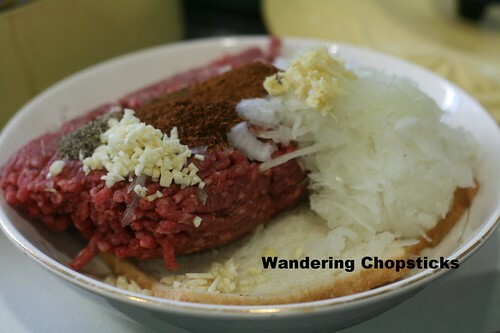 Top with the pho-spiced ground beef patty. Add a few leaves of Thai basil, a few sprigs of cilantro, some bean sprouts, sliced scallions, and squirt on some sriracha and hoisin sauce. Top with the other rice noodle "bun." The pho-spiced sliced beef for comparison. 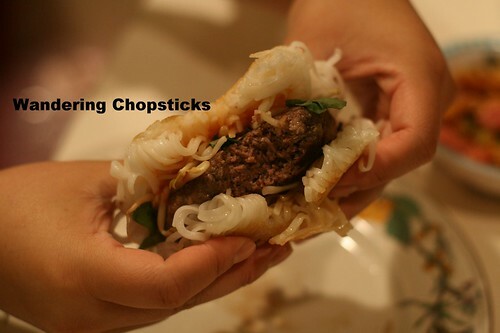 A second pho burger with sliced beef instead of a ground beef patty. So how will they hold up to eating? My sister-in-law served as hand model. It was a bit messy, but she couldn't wait to take a bite. The nephew likes it too. For some reason, I was in the mood to share this with lil' sis and oldest nephew. More feedback, don'tcha know? Plus, I just figured oldest nephew would really enjoy it. So I packed everything up and drove down to San Diego the next day. 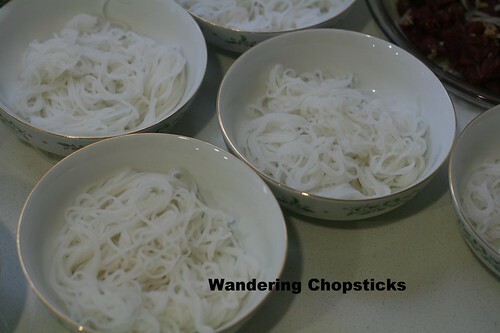 We went through the whole routine again, but this time, I lightly pan-fried the rice noodle "buns." I only pan-fried one side so the burger would hold up better, but wanted the softness of the rice noodles on the other side so it would still be closer to the beef noodle soup. Oldest nephew modeling the pan-fried pho burger. 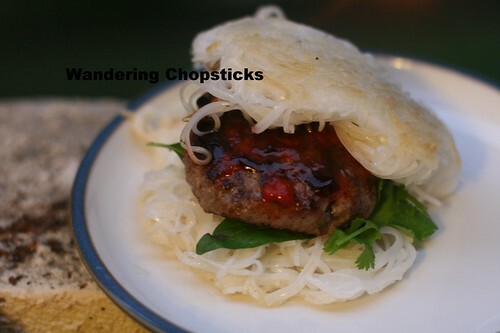 The rice noodle "buns" held up much better with pan-frying, as you can see, but it was also much greasier. 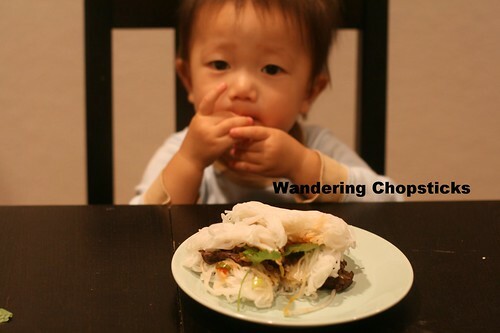 And lil' sis showing how much better pan-frying the rice noodle "buns" held the burger together when eating. I also stopped overthinking as my brother told me to, and served them with hamburger buns. 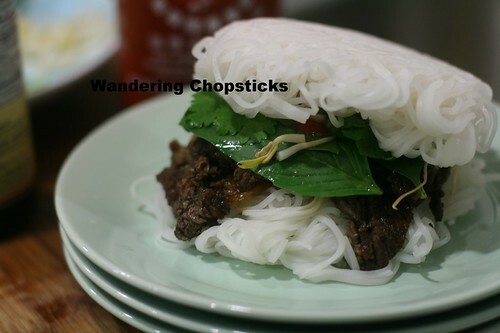 So whether you choose to make rice noodle "buns" or use hamburger buns, my pho burger was just like tasting the beef noodle soup, but in a burger. As for the sliced beef version, I made slight adjustments to the recipe for a truly tasty Banh Mi Pho Bo (Vietnamese Beef Noodle Soup-Spiced Sandwich). 3 years ago today, Fleming's Prime Steakhouse & Wine Bar - Los Angeles (Downtown). 4 years ago today, Manna Korean Restaurant - Rosemead. 5 years ago today, Chinese Eggplant Salad. 6 years ago today, Frijoles Negros (Cuban Black Beans). You could. 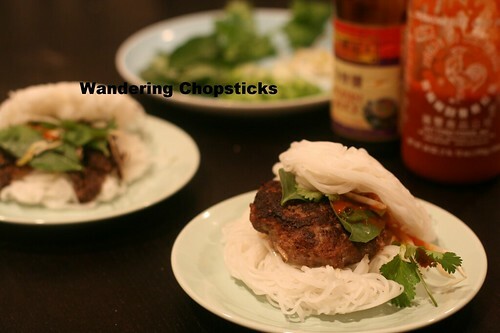 I wanted to make rice noodle buns because it's pho. 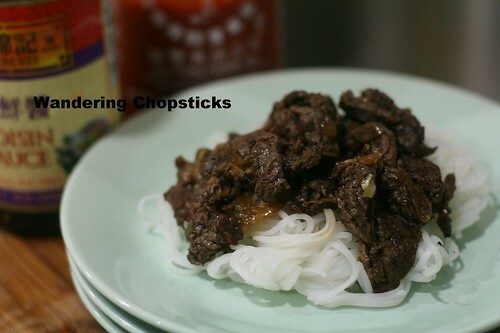 For sticky rice buns, I'd used Vietnamese coconut braised pork or lemongrass beef, which we typically eat with Vietnamese rice balls anyway. I think steamed rice buns (Chinese kind!) would be an amazeballs substitute bun!